If you’ve been thinking of adding more daylight to a kitchen or dark hallway, a solar tube may be the way to go. 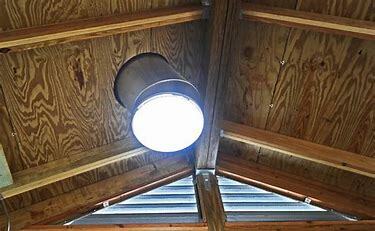 At a fraction of the cost of a skylight, a solar tube provides plenty of warm, indirect light. Known variously as a sun tube, sun tunnel, light tube, or tubular skylight, a solar tube is a 10- or 14-inch-diameter sheet-metal tube with a polished interior. The interior acts like a continuous mirror, channeling light along its entire length while preserving the light’s intensity. It captures daylight at the roof and delivers it inside your home. On your roof, a solar tube is capped by a weather-proof plastic globe. The tube ends in a porthole-like diffuser in the ceiling of a room below. The globe gathers light from outside; the diffuser spreads the light in a pure white glow. The effect is dramatic: New installations often have homeowners reaching for the light switch as they leave a room . A light tube costs about $500 to $1,000 when professionally installed, compared with more than $2,000 for a skylight. If you’re reasonably handy and comfortable working on a roof, install a light tube yourself using a kit that costs about $200 to $400. Unlike a skylight, a light tube doesn’t require new drywall, paint, and alterations to framing members. Related: Which Light Bulbs Won’t Burn You Cost-Wise? A 10-inch tube, the smallest option, is the equivalent of three 100-watt bulbs, enough to illuminate up to 200 square feet of floor area; 14-inch tubes can brighten as much as 300 square feet. Is Your House Right for a Light Tube? Because installation requires no framing alteration, there are few limitations to where you can locate a light tube. Check the attic space above to see if there is room for a straight run. If you find an obstruction, elbows or flexible tubing may get around it. It’s relatively easy to install a light tube in a vaulted ceiling because only a foot or so of tubing is required. Roof slope: Most light tube kits include flashing that can be installed on roofs with slopes between 15 degrees (a 3-in-12 pitch) and 60 degrees (a 20-in-12 pitch). Roofing material: Kits are designed with asphalt shingles in mind, but also work with wood shingles or shakes. Flashing adapters for metal or tile roofs are available. Roof framing spacing: Standard rafters are spaced 16 inches on-center; gap enough for 10- or 14-inch tubes. If your home has rafters positioned 24 inches on-center, you can special order a 21-inch tube for light coverage up to 600 square feet. By installing solar tubes, you’ll get the natural light that skylights provide — but with less cost and less hassle.